DES MOINES – The Iowa Barnstormers have signed running back Malik Brown to the 2019 roster, Head Coach Dixie Wooten announced today. 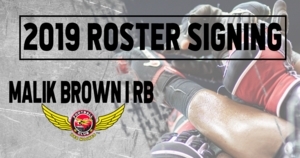 Brown (6-1, 205, Southern Utah University) joins the Iowa Barnstormers for his rookie Indoor Football League (IFL) season. Collegiately, Brown played four seasons at Southern Utah University where he started in 30 total games. In his senior season, Brown led the Thunderbirds in rushing yards with 885, collecting eight touchdowns, 17 receptions and 127 receiving yards. Brown also earned honors as First Team All-Conference two times.